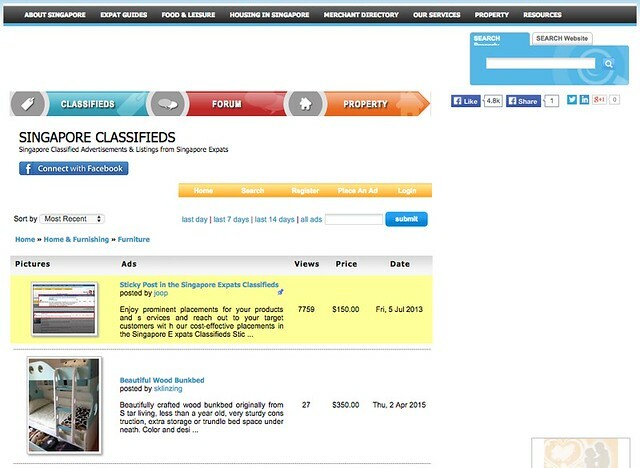 Singapore Expats Classifieds is an online classifieds where you can put up ads to sell your items. You can sell your second hand furniture on the “furniture section” of their classifieds. Placing an ad on the furniture section of their classifieds is not free – each ad will cost you S$8.00 to post. To highlight your ad, you’ll have to pay an additional S$5.00. You’ll also need to register for a membership with the website before being able to post. Despite requiring users to pay for their ads, the website’s ad creation tools offered is basic and lacking. Users are only able to input basic information like ad title, price, and description. Other free online classifieds like Gumtree, OLX, and Craigslist offer many more useful features, like locations and maps, and a better user interface. If you’re an individual trying to sell a couple of your second-hand furniture, it’s hard to recommend paying for ad listings on Singapore Expats Classifieds. If you’re a business owner trying to promote your furniture business, then maybe this paid model would be more suitable. Another negative point about Singapore Expats Classifieds is that it’s filled with distracting ads. Even the paid listing sections of their classifieds are filled with third party ads, this is not ideal, especially for users who have paid for their listings. Overall, it makes for very poor user experience for both sellers and buyers.